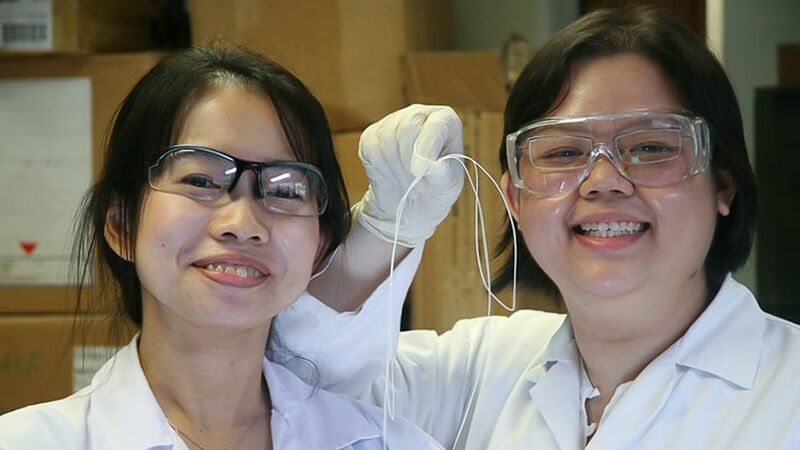 Bee Ting Low (right) and Dr. Widjojo Natalia fabricate hollow fiber membranes for pre-combustion CO2 capture. Photo by Wei Chin Ng. “I wake up every morning excited that the work I am doing in the lab will have a global impact,” says Aluwani Nemukula, a 29-year-old environmental scientist from South Africa. “I like to challenge myself with something that others do not know or do not know enough about,” states Zhen He, 34, an environmental engineer from China. “I am motivated by the possibility of making new discoveries that can really help others,” says Janaina Junkes, a 32-year-old materials scientist from Brazil. “It is the moment you discover something that nobody else has discovered before. Of course, it is not always easy, and it takes a tremendous amount of hard work to get to that point… because, if it was that easy… everybody else would be doing it… right?” asks Jeanne de Waal, a 27-year-old entomologist from South Africa. These are the voices of the previous winners of the Green Talents Competition, a successful programme of the German Federal Ministry of Education and Research (BMBF). Launched in 2009, Green Talents is an international forum for outstanding scientists from around the world working in sustainable development. Every year, BMFF searches the globe for 20 exceptional young scientific minds who work in the areas of sustainability, climate and energy, global change and green growth, resources and the Earth system. Daniela Leme performing a test with cultured mammalian cells. As the United Nations University strives to promote young scientists, strengthen international scientific networks, and generate sustainable solutions to global challenges, the Bonn-based United Nations University Vice Rectorate in Europe (UNU-ViE) supports the Green Talents Competition. So, how does the research of a “Green Talent” contribute to sustainability? Let us look at the work done by two winners of the 2010 Green Talents Competition — Indonesian environmental researcher Tonni Kurniawan and Kenyan civil engineer Mike Otieno. Kurniawan, whose inspiration in science is Albert Einstein, has been recognized for his work on new energy-efficient and environment friendly solutions to treat contaminated water. During his research stay at The Hong Kong Polytechnic University and the University of Eastern Finland, he applied various approaches in his quest to capture water directly from non-traditional sources, such as municipal wastewater, and restore it to near drinking water quality. Pursuing his Ph.D. at the University of Cape Town, South Africa, Otieno is helping engineers and asset managers to construct more sustainable buildings. For this purpose, he is developing a model to predict the durability performance of steel-reinforced concrete structures that are prone to corrosion. Results show that with the availability of reliable prediction models, the development of effective and efficient maintenance and repair strategies can be greatly improved. This in turn, translates to increased service life of these structures. There is currently a lot of interest in this field due to the need to extend the life of existing structures and hence avoid wastage of resources. Every year, the winners of the Green Talents Competition are given the opportunity to meet and exchange views with today’s leading experts in the field of sustainability. While touring around Germany for ten days, these up-and-coming scientists visit some of the world’s leading universities, research institutions and companies, such as Siemens, Volkswagen, Desertec, or Max Planck Innovation. In addition to group meetings, “Green Talents” have individual meetings with renowned experts of their choice. Last but not least, during the year following the award, the winners are invited to return to Germany for an additional stay of one to three months. During this time, the scientists carry out or develop a research project. At the end of the stay, they reflect about their personal experiences and the results of the research stay in a report. Of the 20 winners of the Green Talents Competition 2010, three will enhance their skills by working at the United Nations University Institute for Environment and Human Security (UNU-EHS), also located in Bonn. Adriana Lopez, a 27-year-old architect from Colombia, will focus on the relationship between city and industry, identifying risks related to urban development and poor settlements. South African environmental researcher Paul Jorgensen, one of the youngest Green Talents award recipients at 23, will conduct research on sustainable land management in the framework of the PALM project. “Young scientists bring fresh new perspectives,” Paul believes. Twenty-eight-year-old environmental scientist Binita Shah from India will apply the WorldRiskIndex, a risk and vulnerability measuring tool recently developed by UNU-EHS, to a case study in her home country. Entering its third year, the Green Talents Competition continues its worldwide search for 20 accomplished young scientists working in labs, fields and libraries across the globe. They, like our previous winners, are providing scientific answers to the biggest sustainability challenges faced by the Earth and humankind. We look forward to learning their names and discovering what they are doing to make our planet more sustainable. Contest Winners Shine with Green Talent by Oksana Buranbaeva is licensed under a Creative Commons Attribution-NonCommercial-ShareAlike 3.0 Unported License. Oksana Buranbaeva is Programme Associate at the United Nations University-Vice Rectorate in Europe (UNU-ViE). Having obtained a Masters in international affairs (2004) and a Harriman Certificate in Eurasian studies (2007) from Columbia University, Oksana found her passion in sustainable development and knowledge transfer.